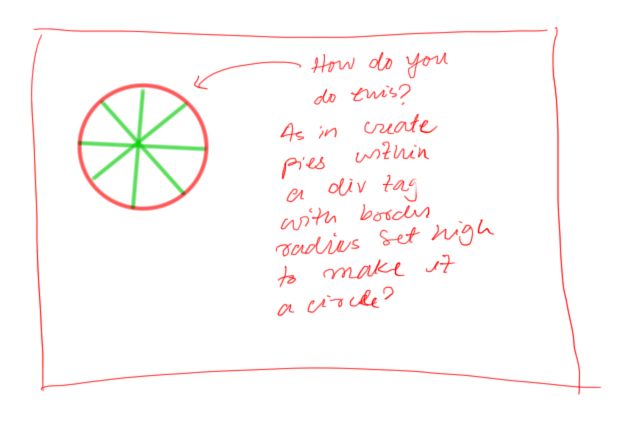 I know you can make a circle in CSS3 using the border radius hack. But is there any way to make them have segments like this picture? Is there a way of doing this through HTML and CSS but not JS? If you don't need the slices to be elements themselves, the you can simply do it with one element and linear gradients - see this rainbow wheel I did last month. If you need the slices to be elements themselves, then you can do it by chaining rotate and skew transforms - see this circular menu I did a while ago. For #2, see also this very much simplified example I did right now. You can use html li element and some css transform to represent each slice of the circle. Not the answer you're looking for? Browse other questions tagged css css3 css-shapes or ask your own question. How to create a sliced circle using CSS3/HTML5?